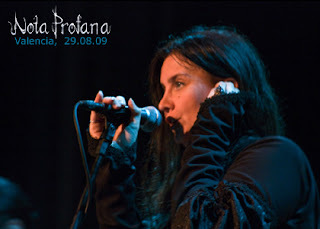 One of the most "gothic-metal" interpretations of Beethoven's Allegretto from the7th Symphony must be Nota Fortuna's arrangement with vocalist Gaby Koss singing some original (I think) lyrics.... It's an interesting mix of chamber strings with electric guitar and drums. Now if only Ms. Koss would do arrangements like this of the song lieder! Another more traditional arrangement of Beethoven with "new" lyrics would be "Joyful, Joyful We Adore Thee" with text by Henry van Dyke using musical themes from the 9th Symphony Ode to Joy. The Filipino American Symphony Orchestra and University of Santo Tomas Singers Alumni, conducted by Robert Shroder, perform Joyful, Joyful We Adore Thee by Beethoven, arranged by Fr. Manuel Maramba, at the Cathedral of Our Lady of the Angels in Los Angeles, California. The text for this version can be found here.